In the first stage of the Cityscape Challenge, we draw the shapes of buildings with different sizes. Because we will be drawing lots of buildings, we will automate the process using functions and variables. A building is a filled in rectangle. 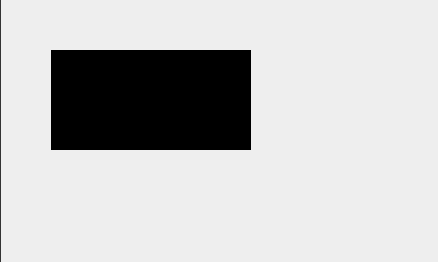 We use the context.fillStyle property to set the color of the rectangle and the context.fillRect() method to draw the rectangle. 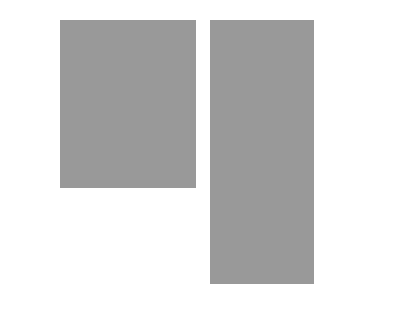 To draw a rectangle, we pass the context.fillRect() method four values.  The first two values are the x- and y-coordinates of the top left corner of the rectangle. We are drawing this rectangle at the coordinates (100, 50). 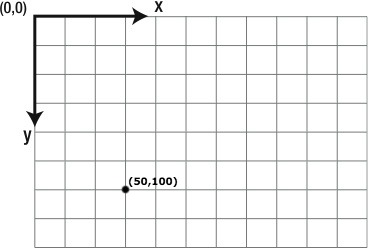 The context's coordinate system is slightly different than the coordinate system we use in math. The origin (0, 0) is in the top left corner of the canvas, not the bottom left corner. 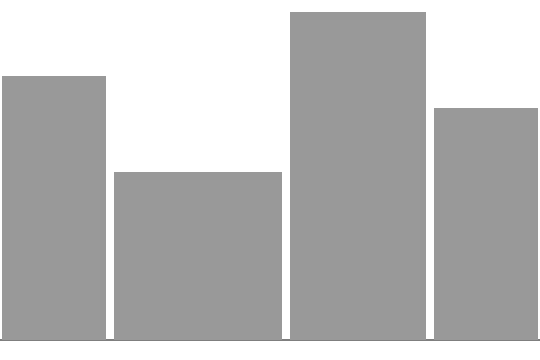 The x-coordinate still measures distance to the right of the origin, but the y-coordinate measures distance down, not up. 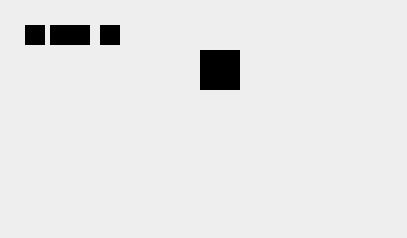 Therefore, the top left corner of our rectangle is 100 pixels to the right and 50 pixels down from the origin. 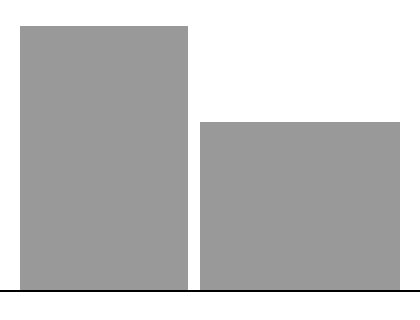 The second two values are the width and height of the rectangle. 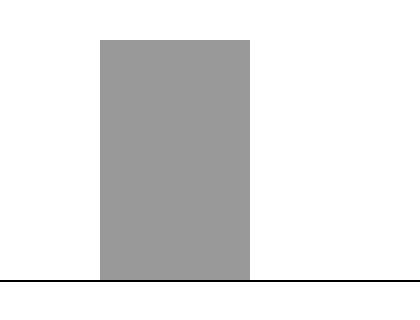 This rectangle is 160 pixels wide and 240 pixels tall. 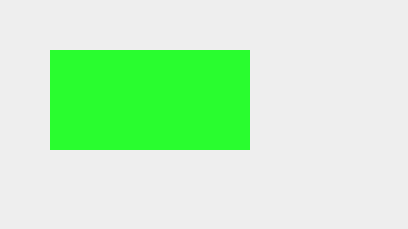 Try changing the first two values passed into the context.fillRect() method to move the rectangle around the canvas. Change the second two values to resize the rectangle. To learn more about the coordinate system, drawing rectangles, and defining fill colors, visit the Coordinates, fillRect(), and fillStyle lessons. Use the context.fillRect() method to draw a building (rectangle) that is 320 pixels wide and 160 pixels tall so the top left corner of the building is positioned at (40, 80). Make sure to draw the ground after drawing the building. If you need help drawing the building or positioning the ground, visit the Coordinates and fillRect() lessons. In this example, we draw a green building (color '#228B22') that is twice as tall as it is wide, and positioned at (60, 40). To change the size of the building, all we do is assign a different value to the variable w. The program automatically calculates the height of the building and assigns it to the variable h.
Change the value stored in the variable w to see what happens. To learn more about variables, visit the Variables lesson. Assign values to the variables x, y, w, and h in the program below to draw a gray (color '#999999') building with its top left corner positioned at (100, 40) and a width of 150 and height of 240. Then, figure out the y-coordinate of the bottom of the building. 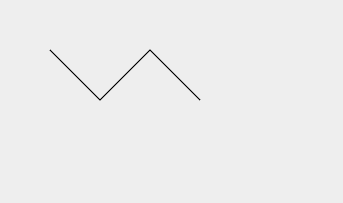 Use the drawGround() function to draw a line representing the ground. Draw the ground after drawing the building. Can you calculate the ground's y-coordinate using the variables in the program? 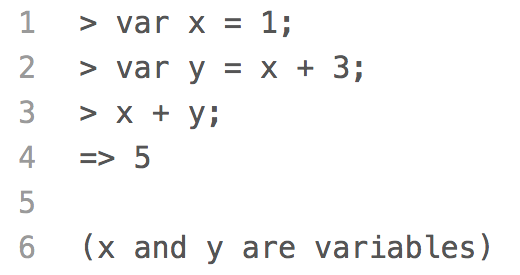 If you need help using variables, visit the Variables lesson. Previous Challenge: View your code from Stage 1 Challenge 1 to use on this challenge. The number of office units on each floor is assigned to the variable units and the number of floors in the building is assigned to the variable floors. Use the values stored in those variables to calculate the width and height of the building. Then, draw a gray (color '#999999') building with 10 floors and 8 office units on each floor with its top left corner positioned at (120, 80). Use the function drawOffices() to draw the offices in the building by passing it the values stored in the variables x, y, w, and h.
Finally, figure out the y-coordinate of the bottom of the building and then use the drawGround() function to draw a line representing the ground. Draw the ground after drawing the building. Previous Challenge: View your code from Stage 1 Challenge 2 to use on this challenge. Drawing a single building takes a few steps. First, we have to calculate the width and height of the building. Then, we have to set the building color and draw the rectangle. Once we start drawing in windows, the list of steps will get much longer. 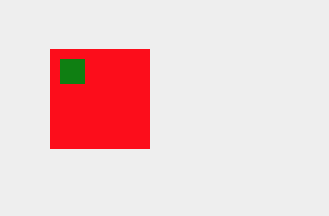 In this example, we create a function that will draw a French flag. 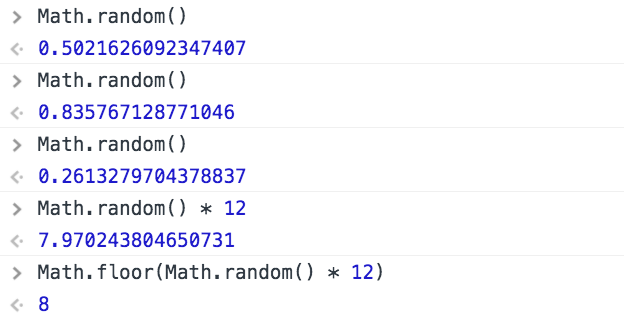 Because we might want to draw a French flag in lots of different places, we make the x- and y-coordinates of the flag parameters. When we call drawFrenchFlag(30, 100), the 30 is automatically assigned to the parameter x and the 100 to the parameter y inside the function. Now we can easily draw as many French flags as we want! To learn more about functions, visit the Functions lesson. Create a drawBuilding() function to draw buildings like the one from Challenge 3.  The function is passed four values that it will assign to the following four parameters. The first two parameters,xand y, are the coordinates of the top left corner of the building; the third parameter, units, is the number of office units per floor; and the fourth parameter, floors, is the number of floors in the building. Inside the drawBuilding() function, use the parameters to calculate the width and height of the building, set the context.fillStyle property to the color '#999999', and use the context.fillRect() method to draw the building. Once the drawBuilding() function has been defined, use it to draw two buildings. The first building has 8 office units per floor and 10 floors, and it is positioned at (60, 20). The second building has 6 office units per floor and 16 floors, and it is positioned at (210, 20). If you need help using functions, visit the Functions lesson. You may have noticed that the two buildings in Challenge 3 are lined up along their top edges, not their bottom edges. In general, buildings are lined up along their bottom edges where they sit on the ground. 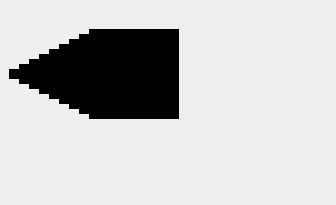 In this example, we create the fillCenteredRectangle() function, which automatically positions a rectangle by its top center point. This function has four parameters: centerX, topY, w, and h.
Since centerX is the x-coordinate of the center of the rectangle, we need to subtract half the rectangle's width to get the x-coordinate of the rectangle's top left corner. Since topY is the y-coordinate of the top of the rectangle, which is what we want, we assign it to the variable y. Now we can easily draw a group of rectangles and line them up by their top center points. To learn more about positioning rectangles using variables, visit the Coordinates, Variables, and fillRect() lessons. Update the drawBuilding() function from Challenge 4 so its parameters are now: leftX, groundY, w, and h.
Inside the function, calculate the coordinates of the top left corner of the building's rectangle. 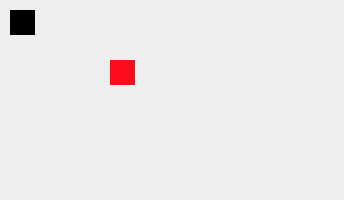 Then, set the context.fillStyle to the color '#999999' and use the context.fillRect() method to draw the rectangle. Once the drawBuilding() function has been updated, use it to draw two buildings. The first building has 12 office units per floor and 8 floors, and it is sitting on the ground at (20, 280). The second building has 9 office units per floor and 15 floors, and it sitting on the ground at (230, 280). 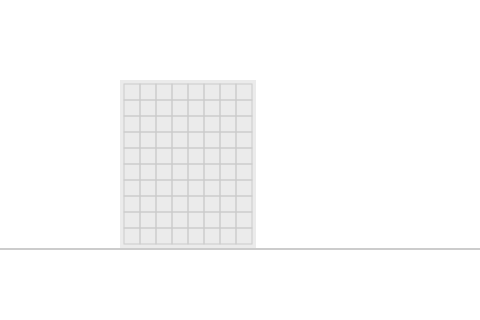 The drawGround() function is used to draw the ground at y = 280. Draw the buildings before the ground is drawn. If you need help positioning rectangles using variables, visit the Coordinates, Variables, and fillRect() lessons. Now we are going to clean up the drawBuilding() function a little bit. A well-written function is like a polite robot who comes over to your house to do a job, and then leaves everything exactly as it found it. 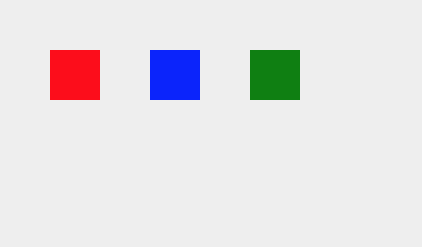 But if you look at the function used to draw a French flag in the previous example, it wasn't so tidy. 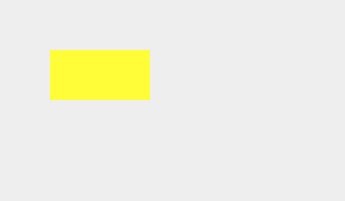 It changed the context.fillStyle property to the color '#EF4135' and never changed it back. To make our function more tidy, we call context.save() at the start of the function and context.restore() at the end. Calling context.save() saves the drawing state of the context (including the current context.fillStyle property) and context.restore() restores the drawing state to the last time we saved it. The other change is to use the context.translate() method. Notice how we had to do calculations with x and y to figure out the positions of the white and red rectangles in the French flag? Imagine we had to do the same for dozens of windows in a building. We can eliminate a lot of that math by using the context.translate() method. The context.translate() method moves the origin of the coordinate system. If we move the origin to the top left corner of the flag, then we can draw the rectangles in the flag as though the flag is positioned at (0, 0). The math is much easier. However, when using the context.translate() method, it is even more important to save and then restore the drawing state. If changing the context.fillStyle property is rude, moving the origin of the coordinate system and not moving it back is much ruder! Try to predict what would happen if we left out the context.save() and context.restore() method calls in the function. To learn more about saving and restoring the drawing state and translating the origin of the coordinate system, visit the save() / restore() and translate() lessons. Tidy up the drawBuilding() function from Challenge 5 in the same way by calling the context.save() and context.restore() methods at the start and end of the function, respectively. Then, use the context.translate() method to move the origin to (x, y) and draw the rectangle at (0, 0). Once the drawBuilding() function is tidy, draw one building with 10 office units per floor and 16 floors sitting on the ground at (20, 290) and another building with 12 office units per floor and 10 floors sitting on the ground at (200, 290). The drawGround() function is used to draw the ground at y = 290. Draw the buildings before the ground is drawn. If you need help saving and restoring the drawing state and translating the origin of the coordinate system, visit the save() / restore() and translate() lessons.